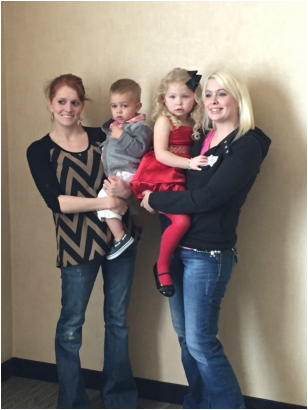 Curwood Festival held their annual Beautiful Baby Contest on Saturday, April 11th, 2015 at the Baker College Welcome Center. Over 40 entrants turned out to participate in the contest. Volunteer judges Sydney Brodeur, Sarah Hoover, and Tiffany Huff had the hard task of choosing this year's winners. After 5 rounds and 5 finalists, Nolan Coleman and Natalie Schanick were chosen as the winners! Nolan is the 17 month old son of Adam and Cassie Coleman. Natalie is the 3 year-old daughter of Jocelyn Sheridan and Daniel Schanick. Both winners received a a free photography session with Ashley Rose Photography and a chance to ride in each of Curwood's two parades: Kids in Curwood Country Parade and the Heritage Parade. Each age group winner walked away with a Curwood Festival Beautiful Baby Tote put together by the following sponsors: Gooding Custom Designs, Paper from Heaven, and Power of Words. Piper Guetschow with her mom, Christina. Nolan Coleman with his mom, Cassie. Mariah Donelson with her mom, Theresa.